Hatters boss Nathan Jones admitted it spiralled into a crazy transfer deadline day after goalkeeper Christian Walton was recalled by Brighton & Hove Albion this morning. The Luton chief had hoped the England U21 international would remain at Kenilworth Road until the end of the season, only for the Seagulls to end his loan stay early due to Niki Maenpaa’s injury in the FA Cup on Saturday. Trust me it was the most crazy day I’ve ever had in my life. I don’t want that kind of day again. 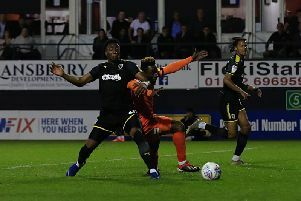 That meant Hatters brought in not just one, but two young keepers to replace Walton, with Reading’s Stuart Moore starting the 3-2 defeat to Cheltenham Town this evening, while a deal to sign Arsenal’s Matt Macey on loan was announced after the game too. With Leyton Orient striker Ollie Palmer joining Lawson D’Ath and Luke Gambin, who signed earlier in the window, in moving to Luton and Craig Mackail-Smith returning to Peterborough, with U18s forward Freddie Hinds heading to Bristol City too, Jones said: “It was going to be just simply transfer deadline, but we lost the best keeper in the league. “We kind of knew half about it last night and then we lose him today, so it’s a difficult one to deal with. “We think the window, we’re going to have no problem with it. We knew we were going to bring Ollie Palmer in yesterday, but there was a delay in that which didn’t really help, and let (Craig) Mackail-Smith go, and then it set off a chain of events that was just crazy. “Because we don’t have to think about think about this game, we’ve got to think about the Checkatrade game and how you move forward with our keepers here as well, so it set of a chain of events that were mental. There had been plenty of rumours surrounding midfielder Cameron McGeehan too, who despite being out with a broken leg, was linked heavily with a move to Championship side Barnsley throughout the day. When asked specifically if the Tykes had come with a bid for the 21-year-old, Jones said: “We’ve had a number of interest for a few of our players, but we’re a strong club and we fend off that because the board are strong.